9.4 Summary of Basic Sidewalk Elements. 9.5 Ambience, Shade, and Other Sidewalk Enhancements. 9.6 Costs and Benefits of Sidewalk. 9.9 References and Additional Resources. Figure 9-1. Photo. An example of a pedestrian-friendly streetscape. Sidewalks are recommended on both sides of all urban arterial, collector, and most local roadways. Although local codes vary, AASHTO and other national publications insist that separation of the pedestrian from motorized traffic is an essential design feature of a safe and functional roadway. The AASHTO Policy on Geometric Design of Highways and Streets (also called the Green Book) does not fully address the issue of sidewalk placement, but in lightly developed areas, the Green Book recommends that rights-of-way be preserved on all arterial and collector roadways. (1) While AASHTO and many other organizations suggest that some short sections of local streets can have sidewalks on one side only, the designer should consider that single-side sidewalks can create unwanted motorist/pedestrian conflicts. Schools within 0.4 km (0.25 mi). Shopping districts or commercial areas. Border areas and buffers from the travel lane. Properly designed stairs (if required). Clearance distances to walls, street furniture, and other structures. Adequate sight distances around corners and at driveways. Continuity of the sidewalk system. Sidewalks require a minimum width of 1.2 m (4.0 ft) clear width from the back of curb (see lesson 8, section 8.6, for more on design requirements). Sidewalks with less than 1.5m (5ft) in width should have passing spaces at reasonable intervals. (2) Walking is a social activity. For any two people to walk together, 1.5 m (5.0 ft) of space is the bare minimum. In some areas, such as near schools, sporting complexes, some parks, and many shopping districts, the minimum width for a sidewalk is 2.4 m (8.0 ft). Thus, any existing 1.2 m (4.0 ft) wide sidewalks (permitted as an AASHTO Guide for the Planning, Design, and Operation of Pedestrian Facilities (AASHTO Pedestrian Guide) minimum) may force pedestrians into the roadway in order to pass other pedestrians. Even children walking to school find that a 1.2 m (4.0 ft) width is not adequate. The desirable width for a sidewalk is often much greater than that required. Some shopping districts require 3.7, 6.1, 9.1, and even 12.2 m (12, 20, 30, and 40 ft) of width to handle the volumes of pedestrian traffic they encounter. Pennsylvania Avenue in Washington, D.C. has 9.1 m (30 ft) sidewalk sections to handle tour bus operations, K Street in Washington, D.C. has 6.1 m (20 ft) sections to handle transit offloading and commercial activity, and the commercially successful boulevard in Barcelona, Spain, the Paseo de Gracia, has 11.0–14.6 m (36–48 ft) sidewalks in most sections. Designers should also consider the commercial need for outdoor cafes, kiosks, corner gathering spots, and other social uses on sidewalks. Sidewalk widths have not been given sufficient attention by most designers. When working in a commercial area, designers should always consult property owners, chambers of commerce, and landscape architects to make certain that the desired width is realistic. Corner or midblock curb extensions can be used for creating both pedestrian storage space for roadway crossings and social space. Bridge crossings are essential to pedestrians and bicyclists. Whenever possible, the sidewalks should be continued with their full width. Figure 9-2. Photo. 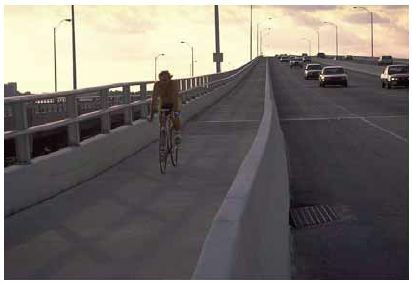 Bicyclists are often forced to use bridge sidewalks when they are not accommodated in the roadway. (This picture shows a bicyclist not wearing a helmet. Sidewalks should be placed on both sides of bridges. Under extreme conditions, sidewalks can be used on one side only, but this should only be done when safe crossings can be provided on both ends of the bridge. When sidewalks are placed on only one side, they should be wider in order to accommodate larger volumes of pedestrian traffic. Sidewalks along rural roadway sections should be provided as near the right-of-way line as is practicable. If a swale is used, the sidewalk should be placed at the back of the swale. If a guardrail is used, the sidewalk must be at the back of the guardrail. There will be times in near-urban spaces where the placement of sidewalks is not affordable or feasible. Wide paved shoulders on both sides of the roadway will be an appropriate substitute in some cases. However, the potential for growth in near-urban areas requires that rights-of-way be preserved. When sidewalks are placed at the back of the right-of-way, it may be necessary to bring the walkways forward at intersections in order to provide a roadway crossing where it will be anticipated by motorists. Security issues are also important on rural area sidewalks, so street lighting should be given full consideration. This lighting can act as part of the transitional area alerting higher-speed motorists that they are arriving at an urban area. Figure 9-3. Illustration. The width of a natural buffer provides the essential space needed for situations such as protecting pedestrians from out-of-control vehicles. An essential buffer between an out-of-control motorist and a pedestrian. Improved sight distances at driveways. Adequate width for landscaping and street trees. A tree setback from the roadway of 1.2 m (4.0 ft) meets minimum AASHTO standards for fixed objects when a barrier curb is used and motor vehicle speeds are 48 km/h (30 mi/h) or less, and is adequate for most species. The area is ample for most snow storage. When this preferred minimum cannot be achieved, any width, down to 1.2 m (4.0 ft) or even 0.6 m (2.0 ft), is still beneficial. Planting strips, especially in downtown areas, may be a good location to use paver stones for easy and affordable access to underground utilities. In downtown areas, planting strips are also a convenient location for the swing-width of a door, for placement of parking meters, hydrants, lampposts, and other furniture. Another way to achieve border width and the needed buffer from traffic is to provide bike lanes. This 1.5 m (5 ft) space creates a minimal safe width to the sidewalk, even when the sidewalk is located at the back of the curb; reduces the effects of noise and splashing; and provides a higher level of general comfort to the pedestrian. Onstreet parking (see figure 9-4) has two distinct advantages for the pedestrian. First, it creates the needed physical separation from the motorist. Second, onstreet parking has been shown to reduce motorist travel speeds. This creates an environment for safer street crossings. Figure 9-4. Photo. Parked cars can also serve as a buffer between the sidewalk and the street. On the backside of sidewalks, a minimum width buffer of 0.3 to 0.9 m (1 to 3 ft) is essential, and up to 1.5 m (5 ft) is desired. Without such a buffer, vegetation, walls, buildings, and other objects located on private property encroach on the usable sidewalk space. With just several months of growth, many shrubs will dominate a sidewalk space. This setback is essential, not only to the walking comfort of a pedestrian, but to ensure essential sight lines at each residential and commercial driveway. If possible, grades should be limited to no more than 5 percent, and in steeper terrain, grades greater than 8 percent should be avoided. When this is not possible, railings and other aids can be considered to help older adults or those with walking difficulty. The ADA does not require designers to change topography, but only to work within its limitations and constraints. Do not construct any grade that exceeds 8 percent. Sidewalks must be graded and placed in areas where water will not pond or where large quantities of water will not sheet across. They should also be designed such that level surfaces are maintained across driveways. Cross slopes should be kept to a minimum as well. Lesson 8, section 8.6, describes the cross-slope requirements for sidewalks, ramps, and curb ramps. The pavement surface should be well maintained and free from cracks, pooled water, and debris. Although most sidewalks are made of concrete, asphalt can provide a useful surface in some instances. On trails, joggers and others may prefer asphalt. As a general rule, however, the long life of concrete and the distinct pattern and lighter color are preferred. Paver stones can also be used, and in some applications, they have distinct advantages (see section 9.5 in this lesson). Contrasting colors of pavement surfaces defines the space for pedestrians and motor vehicles. Since falls are common with poorly designed stairs, every effort should be made to create a slip-free, easily detected, well-constructed set of stairs. The following principles apply: Stairs require railings on at least both side, and they need to extend 30.5 cm (12 in) beyond the top and bottom stair. When an especially wide set of stairs is created, such as at transit stations, consider rails on both sides and one or two in midstair areas. Avoid open risers, and use a uniform grade with a constant tread to rise along the stairway length. All steps need to be obvious. Stairs should be lit at night. A minimum stairway width is 106.7 cm (42 in) (to allow two people to pass), but maintaining the sidewalk width is always best. The forward slope should be one percent in order to drain water. Stairs in high nightlife pedestrian centers can be lit both above and at the side. Other alternatives to stairs such as ramps or alternate routes are advisable so that the facility is fully accessible to all pedestrians. 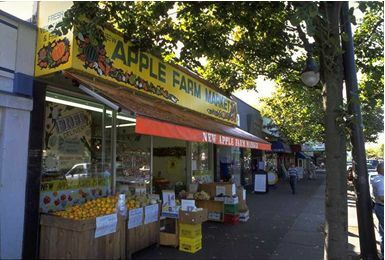 Management of land on the corner is essential to the successful commercial street. This small public space is used to enhance the corner sight triangle; to permit underground piping of drainage so that street water can be captured on both sides of the crossing; to provide a resting place and telephone; to store pedestrians waiting to cross the roadway; and to provide other pedestrian amenities. Well-designed corners, especially in a downtown or other village-like shopping district can become a focal point for the area. 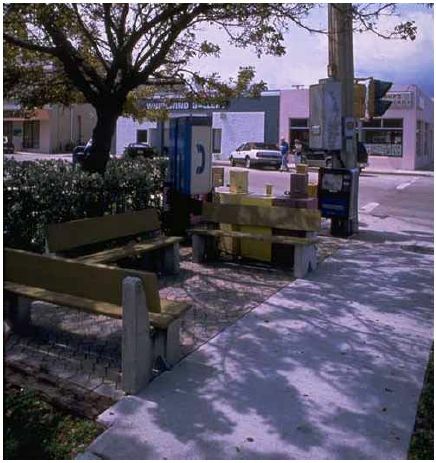 Benches, telephones, newspaper racks, mailboxes, bike racks, and other features help enliven this area (see figure 9-5). Corners are often one of the most secure places on a street. An unbuilt corner, in contrast, erodes the aesthetics of the street and is often a magnet for litter. Caution should be exercised when adding amenities to corners. Too many amenities or improperly placed ones could reduce sight distances and cause either clutter or driver distraction. Figure 9-5. Photo. This corner features public telephones and a sitting area that does not encroach on the walkway. Ramps are essential amenities of corners. To access more information on required ramp dimensions and design, go to lesson 8, section 8.6. Table 9-1. Corner storage space by pedestrian volumes. > 1.2 m2 (13 ft2) Standing and free circulation through the queuing area is possible without disturbing others within the queue. > 0.9 to 1.2 m2 (10 to 13 ft2) Standing and partially restricted circulation to avoid disturbing others in the queue is possible. > 0.6 to 0.9 m2 (6 to 10 ft2) Standing and restricted circulation through the queuing area by disturbing others in the queue range is possible;this density is within the range of personal comfort. > 0.3 to 0.6 m2 (3 to 6 ft2) Standing without touching is possible; circulation is severely restricted within the queue and forward movement is only possible as a group; long-term waiting at this density is uncomfortable. > 0.2 to 0.3 m2 (2 to 3 ft2) Standing in physical contact with others is unavoidable; circulation in the queue is not possible; queuing can only be sustained for a short period of time without serious discomfort. ≤ 0.2 m2(2 ft2) Virtually all persons within the queue are standing in direct physical contact with others; this density is extremely uncomfortable; no movement is possible in the queue; there is potential for panic in large crowds at this density. Note that attractive windows in shopping districts create momentary stoppage of curious pedestrians. This is a desired element of a successful street. These window watchers take up about 48.2 to 61.0 cm (19 to 24 in) of space (see lesson 8, section 8.5 for pedestrian space requirements). The remaining sidewalk width will be constrained. This is often desirable on sidewalks not at capacity. But if this stoppage forces pedestrians into the roadway, the sidewalk is too narrow. There should be 0.9 m (3 ft) of clearance provided for building faces with window front displays (see figure 9-6). Figure 9-6. Illustration. Example of clearances required to maintain effective walkway width. Newspaper racks, mailboxes, and other street furniture should not encroach into the walking space. Each of these obstacles takes up a different amount of space in the walkway as shown in table 9-2, adapted from Pushkarev and Zupan. (7) Either place these items in the planting strip, or create a separate storage area behind the sidewalk or in a corner or midblock curb extension. These items must be bolted in place. Parking meters on a narrow sidewalk create high levels of discomfort. In a retrofit situation, place meters at the back of the walk, or use electronic parking meters every 15.2 or 30.5 m (50 or 100 ft). Parking garages on commercial district walks are ideally placed away from popular walking streets. If this cannot be done, keep the entrance driveways and their curb radii tight to maximize safety and to minimize the discomfort to pedestrians. Table 9-2. Preemption of walkway width. *Note: To account for the avoidance of distance between pedestrians and obstacles, 0.3–0.5 m (1.0–1.5 ft) must be added to the preemption width for individual obstacles. Widths are from curb to edge of object, or building face to edge of object. Sidewalks should be regarded as a transportation system, not unlike roadways and railways, which is connected and continuous. They should not be sporadically placed where convenient, but instead should be provided consistently between all major attractions, trip generators, and other locations where people often walk. When planning and designing sidewalks, gaps in the existing network should be identified and accounted for so that continuity can be established. Section 9.3 presented many of the basic factors that go into designing a pedestrian-friendly streetscape. Table 9-3 presents a summary of the minimum and desired measurements for some of the design features included in this lesson. Table 9-3. Minimum and desirable design features. The above discussion provides a basis for meeting the most basic needs of a pedestrian. In many parts of a city, much more is essential to create highly successful walking corridors. The following elements are often found to be desirable to achieve robust commercial activity and to encourage added walking versus single-occupant motor vehicle trips. One or two very attractive features create a highly successful block, and one or two highly offending or unsafe conditions can leave one side of the street nearly vacant. For both safety and security reasons, most sidewalks require street lighting. Lighting is needed for both lateral movement of pedestrians and for detection by motorists when the pedestrian crosses the roadway. As a general rule, the normal placement of street luminaires, such as cobra heads, provides sufficient lighting to ensure pedestrian movement. In commercial districts, however, it is often important to improve the level of lighting, especially near ground level. Successful retail centers often use low street lamps in addition to or in lieu of high-angle lamps. Some designs permit both the high-angle highway lamp and the low-angle street lamp on the same pole. Pedestrians on a pedestrian-oriented street design (shopping district) benefit from three sources of lighting (see figure 9-7). The first is the overall street lighting, the second is the low placement of lamps (usually tungsten) that reach between and below most trees, and the third is the light emitted from stores that line the street. The potential to be victimized keeps many pedestrians from traveling through an area at night. The omission of any one of these lights can result in an undesirable effect and can reduce the desire to walk or shop at night. Figure 9-7. Photo. Example of pedestrian-oriented street lighting. Lights are beneficial in all areas having crosswalks or raised channel islands. Lighting can either be direct or be placed to create a silhouette effect. Either treatment aids the motorist in detecting the pedestrian. Thus, lighting from shops, street lamps, and highway luminaires is essential to the success of a commercial district. Even one dark spot along a block may force some pedestrians to the opposite side of the street. Landscaping should be provided for esthetic and erosion control purposes in keeping with the character of the street and its environment. Landscaping should be arranged to permit sufficiently wide, clear, and safe pedestrian walkways. Combinations of turf, shrubs, and trees are desirable in border areas along the roadway. However, care should be exercised to ensure that guidelines for sight distances and clearance to obstructions are observed, especially at intersections. Landscaping can also be used to partially or fully control crossing points of pedestrians. Low shrubs in commercial areas and near schools are often desirable to channel pedestrians into crosswalks or crossing areas. It is hard to imagine any successful walking corridor fully void of trees. The richness of a young or mature canopy of trees cannot be matched by any amount of pavers, colorful walls or other fine architecture, or other features. Although on higher-speed roads (64.4 km/h (40 mi/h) and above), trees are often set at the back of the sidewalk, the most charming streets are those with trees gracing both sides of a walkway. This canopy effect has a quality that brings pedestrians back again and again. If only one side can be achieved, then on low-speed roadways, the trees are best suited when placed between the walkway and the curb. A 1.2-m (4-ft) setback from the curb is required. 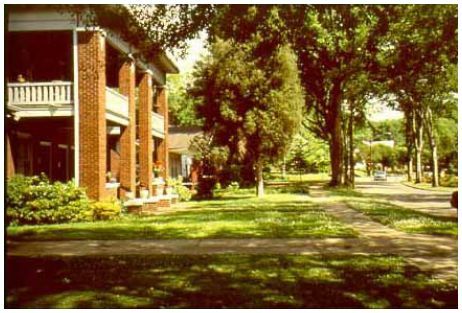 In older, pre-WW II neighborhoods, trees were often placed every 7.6, 9.1, or 10.7 m (25, 30, or 35 ft) apart (see figure 9-8). It is essential to keep trees back far enough from the intersection to leave an open view of traffic. The use of curb extensions can often allow trees near the corner. Figure 9-8. Photo. Street trees provide a desirable pedestrian environment. Colorful brick, stone, and even tile ceramics are often used to define corners, to create a mood for a block or commercial district, or to provide information to those with visual impairments. These bricks or pavers need to be set on a concrete pad for maximum life and stability. A stable, slip-resistant, and consistent surface is beneficial to all pedestrians. Paver stones can also be used successfully in neighborhoods. Denmark is one of many European countries that use concrete 1-m2 (10.8-ft2) paver stones as sidewalks. These stones are placed directly over compressed earth. When it is time to place new utilities or make repairs, the paver stones are simply lifted, stacked, and replaced when the work is complete. Retail shops should be encouraged to provide protective awnings to create shade, protection from rain and snow, and to otherwise add color and attractiveness to the street. Awnings are especially important in hot climates on the sunny side of the street. Small tourist centers, navigational kiosks, and attractive outlets for other information can be handled through small-scale or large-scale kiosks. 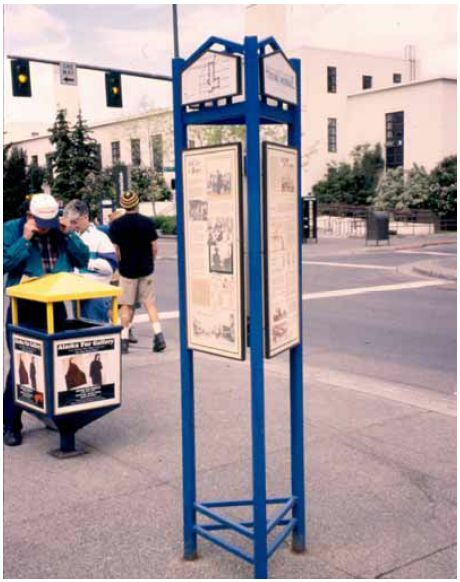 Well-positioned interpretive kiosks, plaques, and other instructional or historic place markers are beneficial to visitors (see figure 9-9). These areas can serve as safe places for people to meet and can generally help with navigation. However, they should not interrupt the flow of pedestrian traffic. Figure 9-9. Photo. Including amenities such as kiosks create pedestrian-friendly spaces. A typical neighborhood lot sidewalk of 1.5 m (5 ft) and two street border trees raise the cost of an undeveloped lot by one to three percent. In comparison, developed residential lots with sidewalks and trees often show an increased property value of $3,000 to $5,000. The Pedestrian Facilities Users Guide states that "the cost for concrete curbs and sidewalks is approximately $49 per linear meter ($15 per linear foot) and $118 per m2 ($11 per ft2) for walkways. "(8) This means that, for a general design assuming a 61.0 m (200 ft) block and a 2.4-m-wide (8-ft-wide) walkway, the cost for the sidewalk would be about $20,600. This may seem expensive, but sidewalks have a long lifespan and a limited cost for maintenance, and they increase the value of adjacent properties for long periods of time. In this lesson, the term public spaces refers to the area around a sidewalk that creates part of the greater streetscape environment. Public spaces should be taken into consideration as important design elements of successful streetscapes. There are many commercial actions that can help bring back life to a street. Careful regulation of street vendors, outdoor cafes, and other commercial activity, including street entertainers, help enliven a place. The more activity, the better. 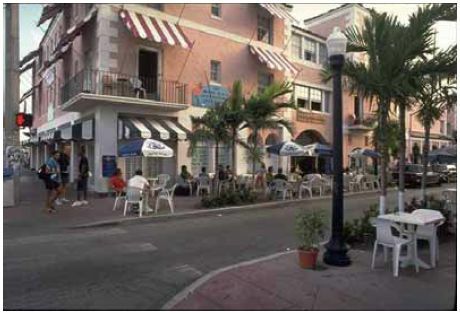 One successful outdoor cafe helps create more activity and, in time, an entire evening shopping district can be brought to life (see figure 9-10). When outdoor cafes are offered, it is essential to maintain a reasonable walking passageway. The elimination of two or three parking spaces in the street and the addition of a curb extension can often provide the necessary extra space when cafe seating is needed. Figure 9-10. Photo. An outdoor cafe can add color and life to a street environment. Alleys can be cleaned up and made attractive for walking. When properly lit and planned, they can be secure and inviting. Some alleys can be covered over and made into access points for a number of shops. The Bussy Place in Boston was an inhospitable alley between buildings. Now with a roof overhead and a colorful interior with escalators, this alley is the grand entry to a number of successful downtown shops. 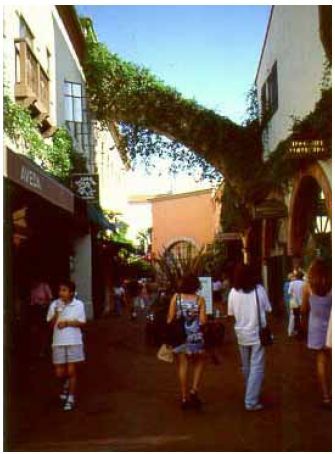 Other alleys become attractive places for outdoor cafes, kiosks, and small shops (see figure 9-11). Figure 9-11. Photo. Alleys can be made attractive and can serve as access points to shops. Victoria, on Vancouver Island, British Columbia, has more than 30 alleys that channel a major portion of its pedestrian traffic between colorful buildings and quaint shops. Some alleys that were originally hardwood cobbles are now polished and provide a true walk through history. The expansion of a midblock set of crossings can help make these alleyways a prime commercial route and can lessen some of the pedestrian activity on surrounding main roads. A number of European cities are reclaiming streets (see figure 9-12). Cars still have access to many of these streets before 10 a.m. and after midnight. Other streets in the U.S. East and West are being converted to transit and pedestrian streets (e.g., the 15th Street Mall in Denver, CO). These conversions must be made with a master plan so that traffic flow and pedestrian movements are fully accommodated. There are many streets in America, however, that have been temporarily converted to pedestrian streets and later, following a lack of use, were then converted back to traffic. In many instances, it has not proven possible to generate enough pedestrian traffic to keep a street alive. Under these conditions, the presence of onstreet auto traffic creates a sense of security for the pedestrian. Figure 9-12. Photo. 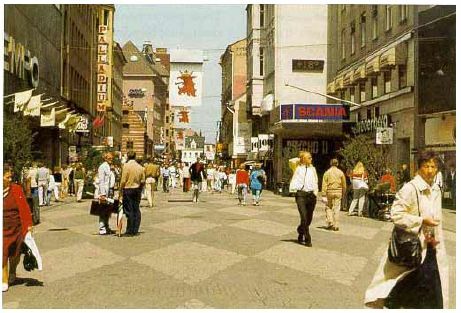 Some European streets have been redeveloped as pedestrian malls. Many plazas constructed in the recent past have been too large and uncomfortable for pedestrians, serving more to enhance the image of the building on the lot. Some of these are products of zoning laws that encouraged plaza construction in exchange for increased building height. However, bonus systems have not ensured that the public space will actually be a public benefit. Decisions have been based on inches and feet instead of on activity, use, or orientation. The result has been a number of plazas with problems: some are windswept; others are on the shady side of buildings; still others break the continuity of shopping streets, or are inaccessible because of grade changes. Most are without benches, planters, cover, shops, or other pedestrian comforts. To be comfortable, large spaces should be divided into smaller ones. Landscaping, benches, and wind and rain protection should be provided, and shopping and eating should be made accessible. The appearance of a crowd in a pedestrian mall provides a sense of interest. It is usually better to be a bit crowded than to be too open and to provide many smaller spaces instead of a few large ones (see figure 9-13). It is better to have places to sit, planters, and other conveniences for pedestrians than to have a clean, simple, and architectural space. 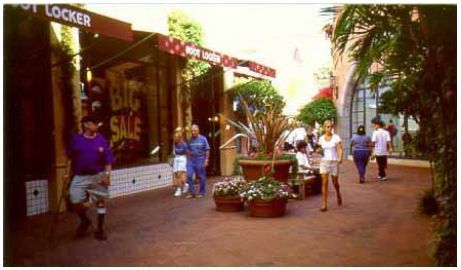 It is better to have windows for browsing and stores adjacent to the plaza space, with cross-circulation between different uses than to have the plaza serve one use. Having retailers border the plaza is better than offices. And, finally, the plaza should be a part of the sidewalk instead of separated from the sidewalk by walls. Figure 9-13. Photo. Small protected spaces provide separation from noise and traffic. Where is the best place for a plaza? 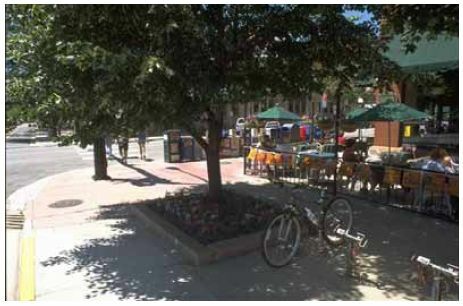 Plazas ideally should be located in places with good sun and little wind exposure, in places that are protected from traffic noise, and in areas that are easily accessible from streets and shops. A plaza should have a center as well as several subcenters. The planner should inventory for spaces that can be used for plazas, especially small ones. Appropriate spaces include: space where buildings may be demolished and new ones constructed, vacant land, or streets that may be closed to traffic or may connect to parking. New stores can sometimes be set back 2.4–3.0 m (8–10 ft) from the street to allow plaza space in exchange for increased density. Limit plaza size to create small, human-scaled spaces. A maximum size of 232.3 m2 (2,500 ft2) is appropriate, with several small plazas being better than one large one. Enclose a plaza on one or two sides. Plan for at least 20 percent of the plaza to be landscaped. Provide seating in the sun and make it readily accessible to the public. Also provide seating in the shade and make it accessible to the public. Develop shops and stores along the plazas, excluding large banks, travel agents, and offices that attract few pedestrians. Do not use large expanses of blank wall. Plan for prevailing sun angles and climatic conditions, using as a rule of thumb a minimum of 20 percent of daily sunshine hours on March 21. Encourage the use of bandstands, public display areas, outdoor dining space, skating rinks, and other features which attract crowds. In cold or rainy areas, a covered galleria would benefit pedestrians more than an open plaza. Integrate indoor and outdoor space to make it more useful. Plan spaces to be small and informal in character and quality so as to be inviting, comfortable, and not oppressive. Avoid sunken plazas, since access is difficult and people feel uncomfortable in them. Keep them level or just slightly below sidewalk grade. For instance, at Rockefeller Center in New York City, NY the lower level originally had shops. These failed and were converted to the now famous ice skating rink. Most people view the rink from above, while only users go below. Avoid architectural and geometrical bench arrangements. Instead, consider where and how most people prefer to sit. One reason so-called undesirables frequent many plazas is that benches are not used by pedestrians. Movable chairs, heavy enough not to be stolen, but light enough to move, are recommended so that people can choose where they want to sit and what arrangement they prefer. Choose an existing public space that currently does not encourage walking and redesign it to better accommodate pedestrians. Your plan should be developed at a conceptual level. You should prepare a plan view drawing with enough information to identify major existing features, proposed improvements, and impacts. Profile and cross-section view drawings are also helpful in presenting particular details required to construct your proposed improvements. Aerial photographs and U.S. Geological Survey topographic maps often provide a good background for overlaying proposed improvements. Expand 15-minute pedestrian counts included in the park usage data to represent hourly volumes. All of the pedestrian volumes at each of the four entrances access the park on existing 1.5-m-wide (5-ft-wide) sidewalks. Establish and document other assumptions as necessary in order to conduct the LOS analysis. Be sure to evaluate the sensitivity of values related to your assumptions. Average weekday pedestrian traffic is anticipated to double in 5 years. Will 1.5-m-wide (5-ft-wide) sidewalks be adequate? Special events will generate pedestrian volumes five times those measured for an average weekday. A Policy on Geometric Design of Highways and Streets, 5th ed., AASHTO, Washington, DC, 2004. AASHTO Guide for the Planning, Design, and Operation of Pedestrian Facilities, AASHTO, Washington, DC, July 2004. Fruin, J., Pedestrian Planning and Design, Metropolitan Association of Urban Designers and Environmental Planners, New York, NY, 1971. Pushkarev, B., Urban Space for Pedestrians, MIT Press, Cambridge, MA, 1976. Zegeer, C.V., C. Seiderman, P. Lagerwey, M. Cynecki, M. Ronkin, and R. Schneider, Pedestrian Facilities Users Guide—Providing Safety and Mobility, Publication No. FHWA-RD-01-102, FHWA, McLean, VA, March 2002. 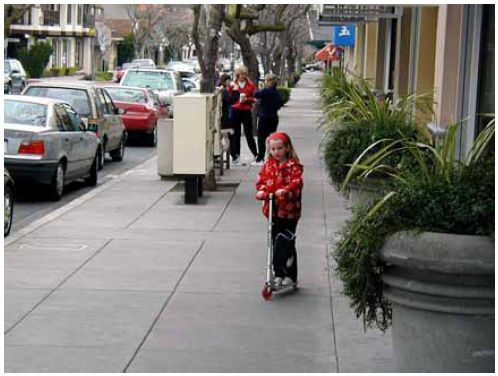 Design and Safety of Pedestrian Facilities—A Recommended Practice of the ITE, ITE, 1998, available online at http://safety.fhwa.dot.gov/ped_bike/docs/designsafety.pdf. Designing Sidewalks and Trails for Access: Review of Existing Guidelines and Practices, FHWA, Washington, DC, July 1999, available online at https://www.fhwa.dot.gov/environment/sidewalks/index.htm. Designing Sidewalks and Trails for Access: Review of Existing Guidelines and Best Practices, Design Guide FHWA, Washington, DC, September 2001, available online at https://www.fhwa.dot.gov/environment/sidewalk2/index.htm. Florida Pedestrian Planning and Design Handbook, Florida Department of Transportation, Tallahassee, FL, 1997, available online at http://www.dot.state.fl.us/Safety/ped_bike/ handbooks_and_research/PEDHBTOC.PDF, accessed April 14, 2003. Oregon Bicycle and Pedestrian Plan, Oregon Department of Transportation, Salem, OR, June 1995. Untermann, Richard K., Accommodating the Pedestrian, Van Nostrand Reinhold Company, Inc., New York, NY, 1984.